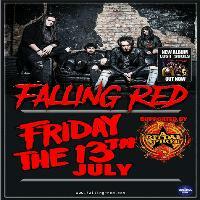 'Falling Red are the Jewel in the UK's Rock Crown' - Classic Rock AOR Magazine. Join us in this Ticket Special £8 ! LIFEBLOOD HEAVY ROCKERS AND METALLERS. Stage times approx 8.15 for support. MIND your gig ticket also lets you stay on to Rock upstairs thro till 3am at Scotlands Longest Running Rock Club.